It now spans over a total of 2320MB total capacity. and roughly 20000 Visitors per month are served with Files. If support is needed, I recommend relying on the Forums ! The 10000 MHz barrier has been broken ! During that time only one ( 1 ) User was provided with Drivers via Email and the help of the remaining, internal mirrors. 100000 Visitors have already used this 3dfx Archive ! I'm glad to say that the involved servers never failed even under the most heavy Download traffic. They have proven extremely trustworthy, and will continue to do so in future. The possibly largest concentration of archived 3dfx Files existing. Without doubt the most passionate and thorough collector and saver of all there can be about 3dfx. A tremendous amount of Files found in this Archive could only make it here due to her unbeaten amount of determination and hard work. Average Users just stopping by and downloading what is needed, have probably no Idea what amount of work and likely, some bit of luck were needed to make alot of this possible in the first place. And an active workhouse when it comes to Forum and NewsGroup support! ...for creating and maintaining what is among the best Driver work existing today. All Users and WebMasters supporting 3dfx! Yet, it was this community that quickly re-formed, and began supporting itself where possible. Against all odds, Driver modifications, Tweaks and Workarounds were found to overcome some of the most urgent Problems! Finally, the 3rd Server is up & running ! Expect a steady stream of new File additions, beginning today. Some finetuning was done to the Webstats Page, as well as some Info Pages generated. ...expect more as soon as the long overdue, additional space I need is available. Additionally, Mark Rein from Epic has announced that Unreal Tournament 2003 WILL support 3dfx Cards! It was already successfully tested on Voodoo3 and Voodoo5. Performance won't achieve records, but testing revealed it was playable on both cards. A 3rd primary server is on order ! This is set out to increase the (presently critical) available, total space to 1570MB. Permissable Traffic will record to 180 GigaBytes ! That should allow to upload a big part of the massive amount of Files that has been collected by external support. Already, Bénédicte, France has located and made available by far more files than anyone else supporting this Archive. It is thanks to her, that many 3dfx related Files thought long forgotten, or even unheard of to date, can be added to this Archive ! In future, the FalconFly Central 3dfx Archive should be ready for any amount of visitors to come. KPNqwest, a major European Internet Router has gone bankrupt. Due to that, Latencies accessing this Archive from inside and outside Europe might have increased to some extend. If you find navigating and initializing downloads slow, just be patient. It's not server Related, until a few days ago, the primary Servers were running off ~10 GigaBit Uplinks combined. But it looks like they're doing fine, just keep it in mind if you run into trouble using this Archive. The W32.Klez Worm is spreading like a pest! Apparently, it has reached a level of distribution unmatched by any other Worm/Virus to far ! This means nothing less, that quite a few Visitors of this Archive are/were running on infected Systems. This, together with the fact that the Worm is intelligent enough to disable common AntiVirus Software such as Norton Antivirus, make it very dangerous. I just thought to let everybody know that (if you happened not to do it yet) it is a very good practise to do a dedicated scan of all your Systems. Another nasty side-effect is, that the Worm uses slightly more intelligent than usual Text displayed in the Topic and Content of the Mail. Therefor, it may appear as a valid, and interesting EMail to read. Do NOT be fooled by the forged EMail Header, which might very well be someone you know and trust! I found the MS-DOS version of F-Prot extremely useful, as it is completely free, and detects everything ,including Trojans, Viruses, Worms, and even Joke Programs. In years of service, it hasn't failed me a single time ! I hope posting this general Virus warning builds awareness against the W32.Klez Worm. Just manually confirm, and don't blindly trust your AntiVirus Software running in the background. It might be already disabled and non-functional ! If you haven't installed some form of Antivirus protection yet, you really should do so and perform a full scan right now ! Development is presently on hold, pending the Programmer to gain insights into the Driver DirectX portions if possible. An ever increasing amount of Problems had shown up when used on a Voodoo3, whereas it mostly worked fine on a Voodoo5 and other test platforms. The 3dfxU V1.09.00 final, once released, will be used to run new Tests, as it can provide a uniform Driver basis. The 3dfx Voodoo3 Win9x V1.03.00 makes the otherwise highly unstable/troubled GTA3 work on a Voodoo3. That's one of the reasons why older Drivers normally left aside by most Users and other Websites are kept in place in this Archive. Just following the old wisdom stating : "Who knows what it might be good for one day?" As you may have noticed, this Archive is presently full. But as (once again) hundreds of MegaBytes of Files are waiting to be uploaded, I decided to give it one more boost in capacity. Within roughly 1-2 weeks, the total capacity will be increased to 1570MB. That should do, however, as hosting becomes more and more expensive, yet no Ad-Banners I want to see here. And finally (if I ever find the time), I will be looking into a re-design of the Site with more capable Software. This is planned to be a transition from functionality alone to a presentation a 3dfx Archive of this size probably deserves. Final versions can come almost every day from now, once last bugs are exterminated. Yet, they assembled two Beta's, already containing some of the anticipated features. User reports will help eliminate the last found problems, and should result in an excellent final release soon. They have taken their place in this Archive not down with other 3rd party drivers, as they are expected to serve as the new Reference Drivers. It is already very capable on a Voodoo5, with a few isolated issues remaining. Voodoo3 capability testing has recently begun. Although still on an Alpha level, is has already achieved and passed several Milestones during testing. Programs were already running, that never before have seen the light on a 3dfx Voodoo card. They have been relocated to a much more capable infrastructure, and performance should be significantly increased. When the total capacity was doubled 4 month ago, little did I realize just how many files were still to be added. That basically puts a halt to larger sized additions at present. They have been announced for Release on 25/05 . The run onto these Files will be tremendous, but with the recent boost in Server performance, this Archive should handle it at ease. Work is in progress to make the 3D Analyzer Tool cooperate better with Voodoo cards. Test platforms so far are the Voodoo3 and VSA100 based cards (Voodoo4/5). I've heard reports that the original V1.3, that makes Games like SpiderMan - The Movie work with Kyro-Cards, is not capable of doing the same magic on Voodoo's. As said, alot of work is underway to change exactly that. On that part, I must say the Author of the Program is a real magician, and is investing alot of time and work to help the 3dfx Community ! There's a Tool existing that allows to run DirectX 8.1 Applications on a non T&L equipped card ! It achieves this by apparently building an additional layer between the Driver and DirectX, enabling it to report a fully DirectX 8.1 capable card if desired. I've been able to run 3D Mark 2001SE in Hardware DirectX8.1 T&L with a Voodoo5. It still crashed on me at the Pixel Shader test, but nonetheless, it went further than with the Geometry Assist (DX 7 T&L). All in all, still Beta of course, and hardly tested, but its use is universal, not restricted to a certain Card. ...but anyway, this Tool might become very powerful, as it can override the Barrier of a DirectX 8.1 capable Video Card requirement. Outage Alert : All servers will be offline over 05 to 06 May, estimated 2200Z to 0600Z ! The 1.09.00 drivers are nearing completion. Barring the chance of some strange issues that could theoretically arise in the final stages of the driver kit compilation, the release shouldn't be too far from now. Thanks for you patience and all of us at 3dfx Underground hope you enjoy the new drivers when they are released. I expect the run on those Files to be a stampede, since the global fleet (!) of Voodoo3-5 owners (I reckon) will be looking to download them. ...but I guess 4 internal Mirrors alone should be able to handle it. Upon User request, welcome the new DesktopTV and VoodooTV Sections. While all Files were available to me for some time now, I never had one of those, and was lacking information. The Info-Pages are in the process of being redone. The Info-Button will now either guide you to the respective ReadMe File, or Screenshot if applicable. This should greatly increase the value of this nifty little Item, as alot of Documents can now be viewed online before Download ! As you've noted, some vast additions were made to the Archive, and it's far from finished. I've recently started downloading some Game Demos to see how well they do on my good old Voodoo5 5500 64MB AGP. I liked the nice running of MOHAA the most, as this seemed to be a very problematic Game for Voodoo's. Oh, did I already mention : I love this Voodoo5 card !!! ? Whenever it comes, I got 4 servers that will host this precious File if needed ! Downloading Frenzy complete, a whopping 1100MB (!) of Data has been aquired and secured. I estimate a good 30-40% of it is totally new to this archive, and some of it I've never seen in my life before. This Archive is therefor continuing to host Files in a centralized, easy to use manner, that are otherwise almost impossible to locate. This will happen at a slower pace of course, as all Files need to be validated and given a quick analysis. Expect random additions within the next days, to all Sub-Sections. My best guess is, that providing the primary ReadMe File for each Package that carries one would be the best idea. After all, those Info-Pages were originally meant to provide useful information about a File, and prevent disappointing downloads. If this turns out to be true, I'll fill the 2 primary servers to the maximum, and use the smaller internal mirrors to offer Files upon User request. That should keep everything running smooth. As you can imagine, the downloading frenzy just got a nice boost ! On the downside of this, I've found many Files which exact purpose I can't fully identify as they lack useable descriptions. I might therefor open up a dedicated Sub-Section for those, and let the Users decide if they are useful or not. Anyway, stay tuned for some vast add-ons to this Archive, getting you even the most remote 3dfx Files existing. I have located a whole truckload of interesting Files; nothing really spectacular, but nicely complementing this Archive. That is something I was waiting for a long time. As soon as that is installed, maintaining this Archive should become an easy task ! After that is accomplished, I'd call the available collection of Files more or less complete! 3dfx Underground is still working on their Driver, being the very first to contain vastly rewritten, optimized code and Features unseen so far (!). While only time will tell if they live up to their promises and announcements, their Alpha Release scored very well already. As promised, alot of new stuff was uploaded recently, including Linux and Mac Drivers, 3dfx Tech Demos, some rare Mac ROM's and more current 3dfx Tools. New server is ready to go ! The DNS switch was thrown sometime today, and everything is up and running. It is now restored to full use, linking most of the files already being prepared on it. www.planetfalconfly.de will be deactivated very soon, and www.falconfly.de will run as the 'one-and-only original' thereafter, as it used to be in the past. Sorry for the hassle, but this is the last time for you to update your Bookmarks; the final Version has been reached ! 1070MB Space, 120GB Traffic possible, maximized access speed, reliability and quality of service, now allowing unified WebStats. First, all files currently spread among the small internal mirrors are being relocated and that way centralized. Then, all the new files I found so far are getting online as well. As of right now, everything is running nice & smooth. I'm looking forward to having all up and running ! Since both big sites will end up running more or less on the same server farm, the trusty Mirror will eventually be shutdown once all is up and running. I consider this the final contribution to this site's server architecture, because that should really do for quite some time to come. My DSL is delaying, though, so it will take quite some time filling the available space with the valuable content. Once all that has settled, I'll try to live up to my promises, and offer not only the best of the best that's out there, but also offer the most detailled Information about every single file listed in the Archive. As of now, this is the best goal I can imagine for this remote site. ....as well as an In-Depth coverage of all advanced options available in modern Driver Releases (Recommended Settings, Benchmarks and Graphical Results). But don't count on that too soon, since this will be alot of hard work to do. Administering it has become a pain, native Webstats are laggy at best, Size too small, Traffic insufficient and it is rather low on performance. It was clear of dedicated Files already for a while, and now has been basically emptied alltogether. For the time being, previous mirror www.planetfalconfly.de will be the place to visit, now running all on its own as primary. In the past month, this server has successfully proven it can hande even heavy loads. Phase 2 : Expect www.falconfly.de to disappear for a few days, maybe weeks, soon. Throughout the move all Files and Pages will be fully available as usual ! But this time, I invalidated the Link within a few hours! The affected small server would certainly break under the workload anyway... I can't afford that, since it holds several other files as well. The Reviews section, The VoodooBoard Forum, and the download list. to VoodooFiles, this is a last resort and I do not want this to happen. server and have no affect on VoodooFiles itself. WEBMASTERS: PLEASE LINK TO THIS PAGE AND NOT DIRECTLY TO THE FILE. IF YOU WANT TO DO ANYWAY, AT LEAST ASK FOR PERMISSION, AND RETAIN THE FULL LINK ! I was naturally quite hesitant to temporarily deactivate and move falconfly.de to the new Host, but it's the only way left. Already now, dozens of Megabytes of pretty cool stuff are spinning on my HardDrives, waiting to be uploaded, but lacking room. That includes 3dfx Tech Demos, the site is still lacking Linux Drivers (shame on me), and a Bios Section. As I continue to search the Web, I'm amazed just how much 'new' stuff and details I find, that I just haven't heard about yet. It's presently located on one of the internal mirrors due to space constraints. ...in case you're not satisfied with its downloading speed, I can relocate it anytime. Basically, I've seen enough from voodoofiles.com. ...they don't seem to like hosting their offered files at the same time. This major burden or downside of hosting (the natural price of being big) is simply posed upon other servers that happen to host the file, just like mine. Starting today, I'll actively cut all connections linking from voodoofiles.com directly to my servers. I'm investing alot of work and money to attain, maintain and expand the availalble bandwidth. Therefor, I think it is understandable I have no intention of continually 'sponsoring' this limited bandwidth for other Websites, ecspecially when not even asked for permission! ...and definitely not if this is attempted even after a request not to do so. It's a simple rule : if you want to be real big, you'll have to pay the bill for it as well. Asking for assistance is 100% fine, just silently taking what you need is not, however. btw. : To nobody's surprise, in the long run my servers can't properly handle the workload of files being downloaded ten thousand times per month as of today. This is still a fairly small Site, and simply wasn't designed for those dimensions. Due to requests, I have started giving Files some more detailled information. How does it look like ? This nifty little Link will reveal all information about a File I can possibly deliver. It should help normal and advanced Users to find what is best for them among the sheer volume of available Files. Note that the info pages take a long time to generate and validate, and will therefor enter service at a rather slow pace. Other than that, nothing spectacular to report. As soon as there's sufficient space available, expect another full load of Drivers. Emphasis will remain on official Releases, Linux Drivers, as well as 3rd party Drivers proven successful, but not yet found on this Site. In particular, that will be the 'GOD' Driver series, Cairey's and IceMan's. I will also have a close watch upon 3dfx Underground's GlideXP Project, that is apparently making progress, and already has developed into Pre-Release Drivers. Beefing up the 3dfx Artwork and Tools Section will get priority, as well as creating a BIOS Section of its own. Server should level-off at uncritical levels by the end of this month. Looks like that Site got more and more 'hollow' over time; at some time in the past they started to offer nothing but Links to Files without actually hosting them. Sad to see they don't even follow their own rules. This makes their download pages appear like they are supposedly hosting all the files, but in many cases they are not. I cannot remember ever having linked directly to another File. Without prior notification and permission, this is in strict contradiction to common 'netiquette' among webmasters. This tiny, remote place has proven it could handle several thousand visitors per day. Server has exceeded 94% due to the enormous hunger for the AmigaMerlin 2.0a Driver. This file is now temporary relocated to an internal mirror. Actually now much new to report... It appears the new design is well appreciated. The SETI Statistics Section has only been updated slowly. I plan on catching up as soon as I find the time. 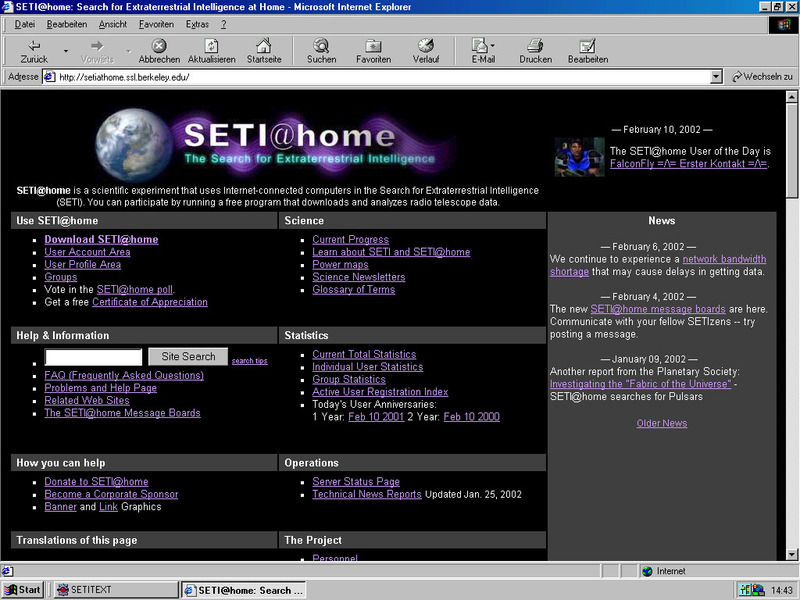 If you have no clue what SETI means, visit their homepage NOW! Overall, this archive is almost busting, and quickly approaching maximum size. Looks like the run on the AmigaMerlin V2.0a Driver is finally fading. Workload on the server has fallen 50%, and it is now projected to continue serve all Files without use of Internal Mirrors. The Feedback Section has been replaced by a simple Guestbook. The old Feedback tools got deactivated for some reason. Now, leaving Feedback should be easier than ever. Moving www.falconfly.de to the new server is now possible anytime. If you've ever visited this remote place before, you'll see the major difference right away! Now, everything is neatly sorted in place, and 120k+ Page Downloads should be History! If you find any errors in the new Design, be it bad Links, missing Files or anything else, please give me a hint. Otherwise, everything is still running smooth. The run on AmigaMerlin's 2.0a WinXP Driver is sustaining though. The Links Section will be filled with Data later and is currently not operational. Within the last days, more traffic was caused than in two usual, entire month! Anyway, the Driver will be kept fully available, being soon relocated to internal mirrors. Since the 570MB total available are already almost exhausted, I might very well extend total Space available to beyond 1000MB. Oops... "Traffic Explosion"... or : "why it's not smart to directly link to files..."
Looks like www.voodoofiles.com does not have too many sites to link (and/or no sufficient own webspace), that can actually handle prolonged high traffic for many Files. Naturally, this would be no problem for me. I'm glad to host any File you see here. Taking into account, that some files can easily generate a whopping 4 GigaBytes per day alone (! ), this can actually kill off a website in the long run. Traffic keeps coming out of 'nowhere', without showing any real visitors. While I don't 'collect' visitors, this figure, when suddenly zooming up, is a nice hint that something unusual is occuring, requiring my attention. After emailing a formal, small request NOT to link directly, the server only received a short break. Worst case the affected File has to be relocated to an internal mirror, but sacrificing speed by doing so. Ultimately, this could lead to temporarily closing this place down within a matter of days. Anyway, so far all runs normal, and no further steps are required. Everything stays fully functional for as long as I can possibly support it.